If someone asked you to think of a superhero, what would probably spring to mind are characters like Superman, Spiderman or countless other comic-book heroes who are able to save the world with their special powers. What Jamie McDonald proved though, is that even normal, ordinary people can do extraordinary things, it doesn’t just have to be limited to fiction. Jamie’s presentation at RDO8 at the Don Carlos Leisure Resort & Spa was incredibly inspirational, motivational and very moving, with those in the audience literally having to hold back tears at times. His life story is absolutely incredible, showing just what you can achieve if you decide to pursue your goals and dreams, and be fuelled by a determination to succeed, despite numerous setbacks along the way. As a child Jamie faced many huge challenges including being affected by syringomyelia, a rare spinal condition which meant he spent around the first nine years of his life in and out of hospital. Jamie’s doctor warned him and his family that there was a very real possibility that he would never walk again. On top of this he had a very weak immune system and suffered from epilepsy, meaning as a child his health was very poor. Through a combination of encouragement from his parents and sheer determination though, Jamie was able to overcome these ailments. Not only did he manage to overcome continuing to be in and out of hospital, he also completely surprised his doctor by not only managing to keep on walking, but also taking up various sports including running, cycling and tennis. Because of those early years of suffering and uncertainty, Jamie has gone on to live life to the fullest. This has included spending several years travelling around the world, training to be a professional tennis player, then switching to become a professional tennis coach. While those things by themselves are impressive considering the tough start that he had, it is the series of charitable challenges that he has undertaken that are truly incredible. After working as a tennis coach, he managed to save enough for the deposit on a house and finally lead the normal life that had always seemed so out of reach. At the moment that he was about to sign the contract on the house though, he had a change of heart and decided he didn’t want the typical life that so many people lead. Instead, in 2012 Jamie took what many would consider to be the crazy decision of buying a cheap second hand bike and cycling 14,000 miles solo from Bangkok, through dozens of countries back to his hometown of Gloucester. Along the way he slept rough, almost ran out of food and water, was shot at and faced many other difficulties. Despite all of this though, he made it back safe and sound to the UK. I have an announcement I thought some of you might appreciate, but I thought I'd start with an emotional memory: this week marks the finish of my very first adventure, cycling 14,000 miles, through 25 countries, from Bangkok to Gloucester. 5 years ago, I decided against buying a house, but to instead use the money I'd saved up to buy a £50 bike and for spending money to try to give back to the hospitals that helped me as a kid. It was without a doubt the best decision I’ve ever made. (Well, that and deciding to tell my Mum every week till the end of my days that she does the best roast dinners as well – a genius idea if I may say so myself). With this decision though – taking a completely different pathway from ‘the norm’ – I didn’t realise the stories it would create… Cycling through China and having to eat pigs ears along the way just to stay fuelled up on energy. Crossing Borat territory like Kazakstan and Tajikistan – and also being caught in a war zone and getting shot at on the Afghanistan border. Then when I thought I was going to die through Iran and Iraq, I ended up drinking endless amounts of cups of tea, having never in my life felt so welcome in a country. The last stretch took me through Turkey, Europe, and back to my hometown, Gloucester. In hindsight, if it wasn’t for all the help of the hospital, I don’t think I’d have the health I do now, and certainly wouldn’t have been able to cycle 14,000 miles. That’s for sure. I sometimes feel like I’m so full up with stories that I've got enough for, well… a book! In fact, that's exactly what this post is about – come next February, you could be holding a copy of my book in your hands (or on a Kindle in your hands – but you know what I mean) ? Here's the exciting bit: if you’re from the UK, you can preorder the book now before Christmas on Amazon, just go to my bio: @MrJamieMcDonald Amazon – I know…! Also, just to let you know that 100% of all royalties from the book will go our charity, Superhero Foundation too (it's not going to earn me any money), but it will hopefully make a difference and help support sick children and their families. Merry Christmas everyone…!!! This wasn’t the end of his adventures though; instead it was only the beginning! Just two days after he got back he decided to try and beat the world static cycling record which at that point stood at 224 hours and 24 minutes. On a bike set up in a marquee in Gloucester, Jamie set about beating the record, overcoming incredible pain, sleep deprivation and medical difficulties and managing to not only beat but smash the record, pedalling for a world record breaking 268 hours – more than eleven days! All these memories… Today marks my psychotic (seriously sleep deprived) day of breaking the Guinness World Record for 'Marathon Static Cycling', non stop pedalling for nearly 12 days. I have no idea how I did it. Here's an extract from a chapter of my book about this record attempt, which if you're from the UK, you can now preorder on Amazon: . . "…two nurses came in with lots of medical gear. They took a photo of my bum (which had been pedalling for eight days straight) to see what they were up against. As everyone huddled around to look at it, everyone's face was grimacing. Then they turned to me and held the image there. Blood was everywhere with white pus oozing out. I nearly vomited. I managed to force out: “Get that away from me! Why did you show me that picture?” . If you'd like to read more about the experiences, you can preorder 'Adventureman: Anyone Can Be a Superhero' from my bio, just click here: (@mrjamiemcdonald). . And as many of you might know, I'm lucky enough to be paid to do motivational speaking, so this book project enables me to give back, so 100% of all the royalties will go to Superhero Foundation, a charity that supports families in need. . Santa's nearly here, I'm very excited, hope you are too!! ?? These two incredible feats were not just for personal glory though, but instead to raise tens of thousands of pounds for a charity that benefits the children’s ward of Gloucester Royal Hospital. By managing to overcome these incredible tests, with little experience of endurance cycling prior to them, this set Jamie thinking about what other things he could achieve for charity if he set his mind to it. In February 2014 he became the first person to run the 5,000 miles from the Atlantic to the Pacific coast of Canada, across the entire country, without a support crew! This was an absolutely incredible journey filled with so many different emotions and extremes. It is a story of incredible kindness and human spirit too, not just on Jamie’s part but also from almost all of the people he met along the way, most of who offered encouragement and support. This included food and drink, shelter, protection and huge amounts of charitable donations. Understandably, there were so many times when he wanted to quit as he faced loneliness, fear, hunger, weather extremes, incredible danger and severe injuries. What he proved though, is how much stronger we are than we are often led to believe. His run which began in March 2013 and lasted a year on the road, raised £250,000 for sick children in Canada and the UK which ultimately made all of the suffering worth it! Overall Jamie’s message is simple, if he, certainly not the fittest or physically strongest person in the world can overcome such huge challenges to help others, then everyone can at least do something to help others. While he wasn’t saying that everyone needs to set out running across Canada or cycling across the world, we can all be superheroes to someone, even without super powers. This includes simple gestures like being more kind or courteous and making changes within work environments to improve the lives of employees and customers. His story was also about how community spirit is so important, even a global community. Without the help of huge numbers of complete strangers across Canada, then he almost certainly wouldn’t have been able to complete this run, or raise such a huge amount of money. Much of the help also came from people following Jamie’s inspiring adventure on various social networks including Twitter, Facebook and YouTube which again highlights how important these have become for connecting people and creating positive change. Despite the negative press that social media often gets, these networks can be incredibly powerful for individuals and businesses to create change, by reaching potentially millions of people around the world. Jamie’s run made him a sensation across Canada, the UK and online, especially as he completed the run whilst wearing a Superhero costume; The Flash. 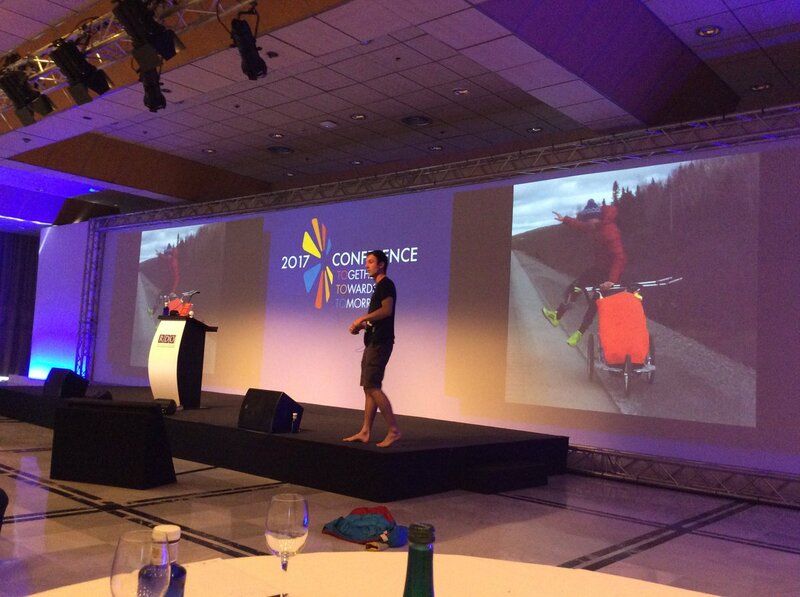 Since that adventure he now travels around the world giving inspirational motivational speeches, like the one at RDO8 and promoting his book “Adventureman: Anyone Can Be a Superhero” based on his own superhero, Adventureman and his feats of endurance. All proceeds from the book go towards charitable causes and it is well worth buying, for both a good cause and to learn more about Jamie’s experiences. Here at RDO we would like to once again thank Jamie for his excellent presentation at RDO8.